The Yelki Flour Mill was built about 1853 by Mr Adamson on the bank of the Smith Creek about 200 metres south of Uley Road and about four kilometres east of the Main North Road. On examining the water flow of the Smith Creek Adamson considered it suitable for driving a waterwheel which could drive the machinery for the mill. Since the Adamsons were themselves implement makers they probably manufactured the waterwheel themselves. The best description we have of the operation and life of the wheel is recorded in the Adelaide Register of October 5th 1903. “Mr James Kelly, Marocara, Gile’s Corner, has written to us relative to the reference to the Smith’s Creek Waterwheel which appeared in the “Early South Australian” column on September 21st. He states that the ‘diameter’ not the ‘circumference’ of the wheel was 35 ft. Mr Kelly says “All the old farmers who lived at Smith’s Creek have passed away. Before Mr Adamson erected the Mill two wet winters had filled the creek, and caused the banks to break away and fresh springs to break forth. When he first tested the water there was sufficient to drive the wheel half a day by holding the water back for the other half. The two rather dry winters during the erection of the flour mill, the supply fell off, and when the mill was finished the water had to be held back for two days to secure sufficient to drive the mill half a day. A steam engine was built as an auxiliary; but the mill, which had cost £7,000 and could store 25,000 bushels of wheat, did not pay, and was soon closed. When the sons took over the property they removed all the machinery” James Kelly had married into the Adamson family and having a family association with the mill would have been familiar with its history and I take his knowledge to be reliable. His statement that the wheel had a diameter of 35 ft. makes sense, as it would require a wheel of that magnitude to drive the mill machinery. A wheel of 35 ft. circumference (i.e. 11 ft. diameter) would have been grossly inadequate. We have no other description of the wheel. 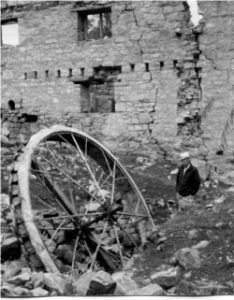 From this information we can conclude that the 35 ft. diameter waterwheel was the only one that ever operated at the ‘Yelki ‘ flour mill. For identification purposes I call it the Adamson Waterwheel. About 1909 the property was acquired by Mr B.A. Kelly who fanned in all 2,100 acres in the area. He kept over 2,500 sheep, a small dairy herd and grew some wheat and barley. In 1911 he had a waterwheel built by Paternoster Engineering works of Salisbury. This was installed at Smiths Creek near the ruins of the Yelki Flour Mill. and was used to pump water from the creek to a storage tank from which it was reticulated around the farm to water his stock. 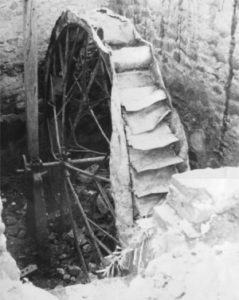 Proof of purchase of this waterwheel was gleaned by Gillian Pearson of the Munno Para Library when she visited the homestead in 1988 during her research into the origin of our waterwheel. An entry in the cash book of the Yelki property recorded the purchase of the waterwheel on the 8th November 1911 from Paternoster of Salisbury for £109/9/4d., plus £17 for installation. The specifications for a waterwheel to operate a pump would have been quite different from that for driving mill machinery. This one was 14 ft. diameter. The Adelaide Chronicle of September 15th 1932 ran a feature article on ‘Yelki’ farm, then run by Messrs B.A. Kelly and Son. It describes the property in detail and mentions the waterwheel being employed at that time and fulfilling their supply of water: underground supplies of water were not easily obtained because of the necessity of sinking a bore to a great depth. Other officers from Munno Para Library visiting the site in 1996 found a waterwheel still in situ; the same wheel. This wheel operated exclusively for fann purposes and although on the same site it could never have been used to drive the machinery of Yelki flour mill. We shall call this the Kelly Waterwheel. derelict wheel from the Little Para and restored it as an S.A. Jubilee 150 project. It was duly set up in the Museum in 1986 and set going by Sir Mark Oliphant on 21st December1986. 00 00 00 00 00 00 ‘. Once upon a time there were three waterwheels. strong enough to drive the machinery that ground . the wheat that made the flour in the mill that Adamson built. to have their turn to pump water.